Collecting Ladybugs is cool for boys and girls is a cool adventure waiting to happen with the Ladybug land. The Ladybug Land is just what you need to lean about the social aspect of the lady bug or lady bird in some parts of the world. Discover ladybug transmogrification in the Ladybug Land! Send in the included certificate and receive your fascinating Pink Spotted ladybug larvae by mail. (Requires $3 shipping and handling when you mail the certificate.) The see-through domed habitat allows you to get a bug's eye view as you watch the small larvae eat and drink from special gels, form cocoons, and emerge as adult ladybugs! 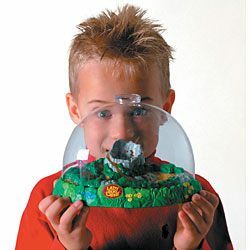 Includes sturdy Ladybug Land habitat, magnifier dome cap, pre-paid certificate for 15 to 20 ladybug larvae with special food and complete instructions. 10 Ladybugs guaranteed to be perfect specimens. Please allow approximately two weeks for your larvae to develop. During extremely hot or cold weather, delivery of live larvae may be delayed. Available only in the Continental U.S. and Alaska. Ages 4 and up. Please note: Live ladybug larvae shipments not available to Oregon.